Our coach came to us in 2008 with a Thetford Aqua Magic pedal flush toilet which was a year, or two old. It has worked well these 3 1/2 years, but all plastic toilets just get harder and harder to clean with hard water deposits, staining, etc. Plus plastic tends to hold odors. So, when our Newell friend, Steve Ward, who also has a 1982 Newell, decided to replace his Thetford with a Dometic 310, which has a PORCELAIN bowl we decided to check his out. Elaine loved the look of it much more, and the porcelain bowl sold her. These toilets run around $125-141 on sale. We got our for $141 including shipping. I ordered it on Wednesday, and it was at my office the next morning....WOW!!! My friend's motivation for replacing the toilet was that his seals were shot, and the bowl would no longer hold water. Our motivation was just to improve our toilet....we thought. It seems Mr. Murphy was peekin' over my shoulder, but this time he didn't have the last laugh! Since we are rolling the coach up to Ventura on Monday I decided Friday (yesterday) was the day to do this "1 hour" job. Our toilet sits on a 1.5 inch plywood platform (1.5" above the bathroom floor grade), and when we had the carpeting replaced with wood flooring 3 years ago we decided to leave the carpeting on the platform as it would have been a pain to remove the toilet and then put it back in again. Nevertheless, Elaine really did not like that carpeting, so we decided that when we removed the Thetford we would replace the carpeting at the same time. So, while I removed the toilet and the old carpeting she went to Lowe's and Home Depot in search of a suitable carpet remnant. The theory was that by the time she returned I would have the old toilet out and the carpet removed, and everything prepared for the new carpet and toilet. It took me about 10 minutes to remove the toilet....that was the easy part. What I was greeted with made my heart skip a beat....just a beat. The carpet behind the toilet was saturated with water. Visions of major wood removal taunted me as I pulled out the 82 staples holding a 2' square piece of carpeting in place (why do they use so many staples?). It turned out the entire piece was damp due to a leak in the water supply line to the toilet. I'm sitting there looking at wet wood and thinking I'll have to remove it all, but how the hell am I going to remove that flange without damaging it? Is it screwed on to the stand pipe, or glued......well, it's been 29 years since it was all installed, so even if it is threaded, how will I get it loose without damaging everything? It's starting to look like a 1 week job, not a 1 hour job. Before I caused any damage I decided to call Steve.....we have basically the same setup. He didn't know if the flange was glued, or threaded, and said I might have to cut it off....NO!! Then he asked about the condition of the wood....was there any visible rot? Were there any soft spots in the wood? Is there any warping? I replied that the wood was just wet, but looked fine. Good, he says, that means the leak is pretty recent. Just put a ceramic heater in the bathroom, and close the door for a few hours and see if the wood dries out, so I did. Within a couple of hours the wood was dry, and there were still no soft spots. It's obvious that this plywood must be marine grade, as regular plywood would begin to warp and delaminate pretty quickly. Anyway, we decided to postpone the installation of the carpet allowing the wood to finish drying completely, and just install the toilet. 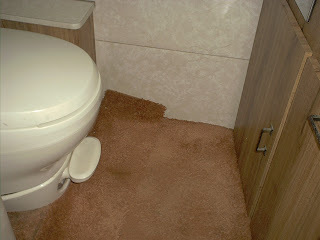 When we get back from Ventura we'll install the carpet around the installed toilet. Since today is Saturday it must mean I have soccer matches that need attention. Today I have a "late" start....11:45am down at U.C. Irvine at the Premier league. Three Boys U-17 matches with my center being the last game of the day. Tomorrow it's back to my schedule from last Sunday....5 League Cup matches starting at 8am, with two centers. I'll be gone all day, and will be very tired Sunday evening. Here is the view I am greeted with most every day (that it's sunny), and here is what the park looks like when it is pretty full. Surprising how many families camp on Holloween!!! There are a lot of creative Holloween displays here in the park this weekend! Monday through Friday last week we had a heavy marine layer, and fog on several of those days. Then, magically, as if a lever was pulled, we had summer on Saturday and Sunday....low 90's, and clear skies. Monday morning the "lever" was pulled again and we are back to heavy marine layer, and rain! The skies partially cleared by Noon yesterday, but then mid afternoon we had 20 minutes of heavy rain, and then the sun came out again. Last night it rained again, and we have awoken to a heavy, heavy marine layer. Ironically, this next weekend the forecast calls for "summer" again. The weather is flippin' and floppin' just like a politician. Enough with the weather talk, but as you will see, the weather is woven through our activities the past 8 days. Last Friday we got a call from Kool Filtration regarding the need to do our annual servicing of our reverse osmosis (RO) water purification system at our house. He said he could meet us around 1:30pm, so we decided we would ride our tandem the 13 miles (26 round trip) over to the house to meet Ruben, and then ride back after he finished. It was a perfect day for riding....very overcast, and temperatures in the high 60's. We took Crestmore over to Riverview and then up to Mission Blvd. which would take us all the way to Ontario. We arrived just after 1:30pm and Ruben arrived a few minutes later. He was done within 20 minutes, I wrote the check for the service, made arrangements for Ruben to come to our coach in January just prior to our departure and service our RO system in the coach, and then jumped on the tandem for "home". We decided to take a different route home....who likes to see the same scenery? We headed east on Riverside Dr. to Etiwanda where we turned south to Belgrave, and then east again to Van Buren, and then south again to Limonite where we angled eastward back to Riverview and then Crestmore and home. On the way we spied a Carl's Junior where we decided to have an early dinner, and use some coupons out of our Carl's Jr. coupon book our daughter gave us a few months ago. Those suckers are only good until December 31st, so we need to start using them. We finally arrived home around 4pm. Our cyclocomputer showed that we average 13.8 miles per hour and that our riding time was just under 2 hours round trip! Saturday I was scheduled for 5 soccer matches...3 as assistant referee, and 2 as center. Sunday's schedule was the same....so 10 matches in two days in temperatures in the low 90's and NO BREEZE! With no breeze it seemed like 100! The site was the San Bernardino Soccer Complex located in Highland.....about 20 minutes from Rancho Jurupa. I was on fumes by Sunday at 5pm, but had a large wad of 20's, 10's, 5's and dollar bills to show for it, and another $500 went into the fuel fund! On top of that I got some good exercise, and my legs are feeling much better after a few weeks of soccer. 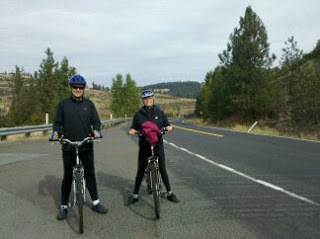 Elaine and I have been riding our bikes 5 days a week consistently since we got back from Spokane. We have this 8 mile loop we do most days, with a longer ride like last Friday's mixed in for variety. We've both dropped about 5 pounds! We had 6 cabins rented this last weekend so after our bike ride yesterday we went and pulled the soiled linens, and cleaned two cabins. We'll clean 2 more today, and the final two on Wednesday. So far only 2 are rented for next weekend. We'll get those cleaned along with any last minute rentals Sunday afternoon, and Monday morning. 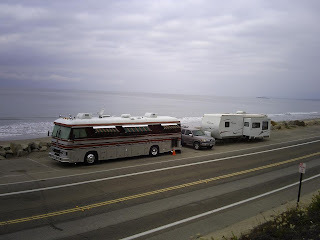 Monday afternoon we will pull anchor and head up to Rincon Parkway, north of Ventura, for 4 days! Will be great to roll the tires....we haven't left the park since we filled up with propane in early August. Looking forward to hearing the sound of the surf just 20, or 30 feet from our coach at night, watching the sun set over a campfire, and doing some great bike riding. On Rincon Parkway a couple of years ago. As I am writing it has started raining again.....well, more like a drizzle. Looks like our daily bike ride may occur later in the day. Oh well, now that Elaine is retired it doesn't really matter. As long as it's not 100 degrees outside, or raining we can ride at our leisure! Elaine is really enjoying her iPad. She's reading books on it, taking care of e-mail, surfing the "net". That brings you up to date....thanks for reading!! Is this May, or October? The weather pattern around here is reminding me more of May/June gloom, than clear, dry Fall weather that normally prevails this time of year! Once again we are socked in with a very heavy, deep marine layer that will hang around until early afternoon again according to weather.com. Don't get me wrong.....I love cool, partly cloudy weather, and I certainly prefer that to hot, mind numbing heat. Having lived in Southern California since my birth in 1949 I've had my fill of sunny, hot weather over the years......after all that's what you get when you live in desert environment, which, essentially, is what Southern California is. I am beginning to chomp at the bit to start turning the wheels of our home down the road seeking new horizons, and chasing short pants/t-shirt weather. When I am refereeing a soccer match that is pretty much on "autopilot" (by that I mean managing itself, requiring very little interference on my part), as I was last night, my mind starts to drift to the time when I will no longer just be dreaming of our life on the road, the hum of the tires as they drive us toward that horizon presenting new vistas, new adventures, new friends, and, yes, new challenges. I am ready! Bring it on! Here is what our park looks like on a Thursday....wait until tomorrow afternoon! We are currently researching our options for changing our domicile to another state. There are so many things to consider. The Escapees website seems to have a lot of good information on how to make that decision. We don't have to make a decision right away, but within the next few months we need to decide. This weekend will be a busy soccer weekend for me. In addition to the normal Coast Soccer League games my referee association handles we will also be covering a lot of fields for League Cup, which is in its 3rd week. Just this weekend our association will cover 500 matches. My share is 5 matches on Saturday, and 5 on Sunday, with 4 of those being as the center referee. It will also be a good "payday" for me.....almost $500 in cash, which will go into our diesel fuel fund. Many of the large truck stops, and gas stations offer 15-20 cents discount for cash. That can save us over $30 on each 180 gallons. By the end of December we should have enough saved to pay for 2 years of fuel for the coach! We had been planning on pulling up anchor and setting sail for new horizons on January 2nd, but now we have pushed that back a few weeks to January 31st. The lease on our home comes up on the 31st, so we need to be here to be sure every gets "signed, sealed and delivered". In addition it will allow me to do another 4 weeks of Coast Soccer League, and High School Soccer. The money from those 4 weeks will more than pay to install a solar recharging system on the roof of our coach. Being able to dry camp, and boondock is an important part of our plan. The more we can avoid having to "hookup" the lower our operating expenses will be. So, that is where we are at, and where we are heading. Thanks for reading! Woke up this morning to as heavy a fog as I have seen in years. Could not see Mt. Rubidoux, or any of the other hills surrounding the park. Could barely see the cabins. When I checked weather.com and saw that the fog would "hang" around until almost 1p I knew we weren't going to get our early morning bike ride in today. We decided to clean the last 3 cabins first thing, and hope the fog lifted enough by 11am to take our ride. That plan worked out perfectly, and we were able to start our ride about 11:30am. So far, there are only 3 cabins being rented this weekend, so Monday will be an easy day for cleaning them. The next weekend only 2 are rented, which will make it easy for us to get on the road Monday, 10/31, up to Ventura. As we suspected, the rental rate has begun to decrease as we get further into the Fall season, and temperatures cool. Today, Wednesday, is also "mow" day....this is the day each week when the county mows and edges the grass in Cottonwood, where we are staying. It takes 5 people all day to manicure the grass just to give you an idea of how much grass there is. It is one of my weekly pleasures to watch someone else mow the lawn, and it doesn't cost me a dime! Heading out in about an hour to referee an adult soccer league I do once a month. The park is pretty empty right now.....a few "snow" birds, and a few campers who move from local park to local park living in their RV's....a symptom of our economy. They range from young families with small children trying to make ends meet, to groups of 2, or 3 adults who have banded together to keep costs down. As I have said before, you are only allowed to camp here in Rancho Jurupa Regional Park 14 days out of every 30 days. Most of the County parks in the area, including Yucapia Regional Park, and Prado Regional Park have this same limitation. Well, that's it for today. I am hoping to begin posting now on a more regular basis, so check back to see what we're doing tomorrow! On September 30th Elaine worked her last day for her employer of 20 years. 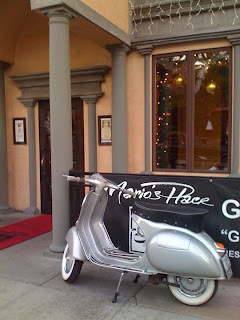 We went out for an amazing Italian dinner at Mario's Place in Riverside to celebrate. 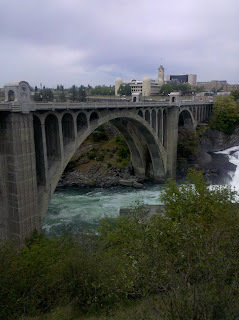 Returned from our trip to Spokane, WA.....a week of relaxation, many, many naps, hikes, bike rides, anniversary celebrations, a trip to Cabela's, and walking in the rain. Our Alaska Air flight from Ontario to Seattle left at 6:20am. Our second leg of the trip was aboard an Alaska/Horizon Air propjet into Spokane arriving just before Noon. It rained all the way from Seattle to Spokane, and as we deplaned from the propjet we got a little wet walking across the tarmac into the terminal. All in all it was a fast trip...less than 6 hours....of course we had to get up at 3am in order to be at our home (where we would leave our car for the week we would be gone) and meet the shuttle service that would deliver us to the airport. Since our plane left at 6:20am the latest Super Shuttle would pick us up was 4:20am. It's only 10 minutes from our house to the airport so we had a 2 hour wait....don't you just love sitting in airports waiting for flights? 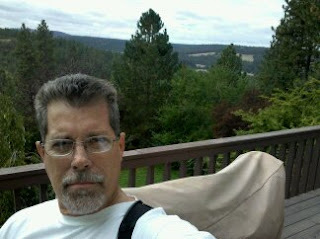 My sister and her family live in the hills on the southwest part of Spokane. Their home is about 10 minutes from downtown. The home has 3 levels, including a full basement that they had built out when they bought the home a few years ago. The basement is just under 2,000 square feet all by itself, and is divided into four areas......a family room with a large screen TV, a media room with theater seating, a guest bedroom (The Queen Suite) with its own full bath, and a large guest suite (The King Suite, of course!) 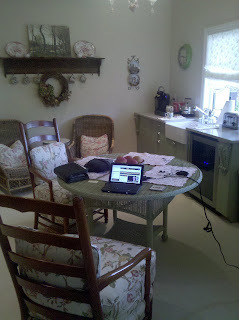 with a kitchen, dining area, bedroom, bathroom, patio, and laundry.....that is where we stayed. We slept in until after 8am almost every day. Since we had our own coffee maker in our suite we didn't have to run upstairs for our morning dose of that wonderful elixir! We had a wonderful trip, and thoroughly enjoyed visiting with my sister and her family. We loved hearing the rain during the night, and taking walks in the gentle rain that fell 5 out of the 7 days we were there. 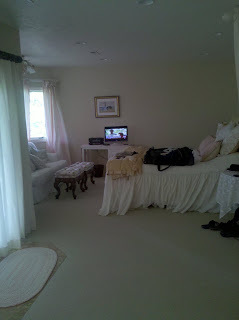 We watched several movies with our hosts in their media room, and many college and NFL football games over the weekend. We did a 13 mile bike ride on the one clear day along Hangman Valley Road. What a great way to celebrate Elaine's retirement. Just before we left for Spokane I bought Elaine an iPad, and a Kindle for myself on Ebay. Since she no longer has her company laptop she needed a computer. She decided what she wanted was an iPad. Both items were waiting on my desk when we returned from Spokane. Elaine is going through her learning curve on the iPad, but she loves it a lot! The first book I downloaded was "The Sun Also Rises" by Ernest Hemingway. Much to my shame I have never read any of his books. I became fascinated with him after seeing the recent Woody Allen movie "Midnight in Paris" on our Texas trip, and then on the trip home from Texas read a long article in the Southwest Airlines in flight magazine about his life and times. The weather is decidedly cooler at night, and, although the temps are still in the 80's during the day it just feels like Autumn should feel. I'm doing soccer each weekend, and will be attending the High School soccer recertification class next week. This is my last Fall soccer season, and the High School season will be my last. I have bittersweet feelings about finishing my career as a soccer referee, but would rather go out this way than gradually finding myself assigned less and less competitive matches as I get slower and older. I'm still being sent to do CSL Premier games down at UC Irvine each weekend, and that's how I want to end.....on my terms, when I decide....still at the top. Since Elaine retired we have been riding our bikes virtually every week day in the morning. We've developed an 8 mile loop that takes us across the Santa Ana River, over to Fairmont Park where we ride around the man made lake, down Market to Mission Inn Blvd. and home. The first time we did the loop it took us 46 minutes. Our last ride it took us 39 minutes! Today while Elaine drove down to South Coast Plaza near Newport Beach to have lunch with an also retired work friend I spent time checking the coach over. First on the list was to pull each battery tray out, check water levels, and check the batteries for overall condition. The first battery I pulled out had a problem. The positive post is "pulling" out of the casing for some reason. Interstate Batteries will warranty the battery, so I just have to pull it out and take it in for exchange. Fortunately, the other 3 8d batteries checked out fine. But, that is the whole point of preventative maintenance....find the stuff that is failing and replace it before it breaks. I also checked the oil level, coolant level, etc. and that all checked out fine. Tomorrow I'll check the air pressure on all six tires. We're planning on driving the coach up to Rincon Parkway just north of Ventura on Monday, October 31st where we will spend 5 days. Well, that's it from Rancho Jurupa Regional Park. All is well as we drift ever closer to pulling up our anchor and heading out on the road. Thanks for reading! !